Go to any high school basketball game during the winter, and there are a variety of emotions on display – from full-fledged frustration all the way to the uninterested who are patiently waiting to see the clock reach all zeros to return home. Both sides of this feeling and interest are fine, but this past weekend there were two moments that will stand in my memory, and probably the memory of those who watched them progress as well, for a very long time. When it comes to late-season high school basketball — you know, right before tournament play begins — emotions can be running high. Players are possibly looking toward spring season with a fresh start in a new sport. Some teams are battling for conference championships and tournament seeding, and others are just waiting out the days to wrap up the regular season to get to tournament play. Those reasons aren’t for me to judge, but there were two moments from this weekend — well, they even brought more emotion than usual, and I’m someone who watches game after game, night after night, and lives in a world of stats and notes to tell a story. Here are two stories that need to be told and celebrated. Friday night, the Whiteoak Wildcats lost to the West Union Dragons in a game with not only Southern Hills Athletic Conference standings on the line, but even more so, possible tournament seeding, too. The Wildcats lost to the visiting Dragons, 52-47 in front of a packed gymnasium at Whiteoak High School on senior night. Even though it was a loss on the scoreboard, as time passes, not many will remember what happened when it comes to the stat sheet or final score. What will be remembered is one moment in the fourth quarter which stood out more than who won or lost, and that moment was the final two points of the game scored by Whiteoak senior Nate Frazer. Wildcats head coach Blake Kibler made the call to put Frazer on the court, as he entered the game in front of his home crowd for his well-deserved big moment. 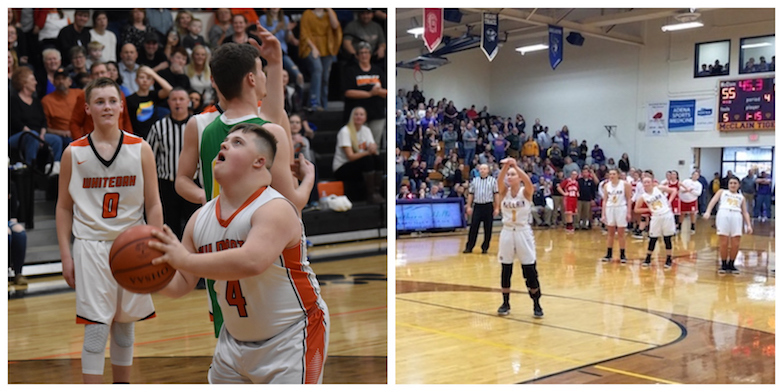 Frazer, who is a special-needs student at Whiteoak, began the evening by leading the Wildcats onto the court, and in the final moments of the game he — with the help of the opposing Dragons — took a few shots at the hoop. Then it happened … Frazer knocked down the two most exciting points of the game, bringing the entire gymnasium to their feet in cheers. That moment made me and many others not worry about who won and who lost, and it made someone like me, who is programmed to write and take stats, remember why I love sports and why sports are so important in the grand scheme of life. Sports are more than just who gets the ball on a given possession or what the final score is. To be honest, when it comes down to heads and tails so to speak, unless a championship is won or it is a game-winning shot, just how many final scores do any of us really remember? What I will remember from Friday night is the pure joy and excitement displayed by Frazer, as he celebrated his basket and was picked up by teammate Deavin Cumberland for all to celebrate. That moment in time is what I’ll remember the most from that game, and hopefully many others will as well. If that wasn’t enough, then came Saturday afternoon, when the McClain Lady Tigers faced Highland County rival Hillsboro at McClain Gym. That day, the Lady Tigers also honored all the seniors, but before that story, we need a quick backstory. During the fifth game of the season, McClain senior and standout player Maddy Stegbauer tore her ACL in a home game against Huntington. That moment in the third quarter was one of the worst moments I’ve witnessed as a sportswriter for the reason it was heartbreaking to see such a talented career come to an end like it did. On Saturday afternoon, though, there was cause for celebration because the starting lineup included Stegbauer, who was on the court for one last time. The tip-off included senior teammate Bryn Karnes sending the basketball to Stegbauer, and then, with some tears rolling down her face, Stegbauer walked over to her sister and sophomore teammate Emma and handed her the basketball to a standing ovation. That moment would have been great on its own, but unexpectedly late in the fourth quarter – with the game in hand by the Lady Tigers – one of the greatest displays of sportsmanship occurred, and it all started with the opposing coach and a self-inflicted technical foul. Hillsboro head coach JR Moberly took hold of the basketball late in the game on an inbounds play and asked the official to give him a technical foul. Why, you might ask? Because on a technical foul, any player on the opposing team can shoot two free throws, and that is where Stegbauer’s story took the aforementioned unexpected turn. With Moberly and the Lady Indians showing the ultimate display of sportsmanship, Stegbauer got to return to the court one last time at McClain Gym and take two final shots to wrap up her high school career. Though neither free throw was made, those free throws were more about what is good about high school athletics, as Coach Moberly aided in Stegbauer living out one last opportunity and getting to play at McClain Gym one final time. These two moments from this past weekend are about much more than the points that were and were not scored, or about who won and who lost. Those two moments were more about life in general and showing sportsmanship and respect to those around us. Those moments were more about celebrating the moments in life and sports that matter and enjoying those moments. It also showed what decency and humility can do to improve a day, month or year, and in the grand scheme of things, that is what is most important when it comes to high school athletics. Thank you to all of those involved who helped two players have special moments on the basketball court this weekend. Thank you for showing what high school sports should be about, and that maybe the final score isn’t as important as we make it out to be. Stephen Forsha is the sports editor of The Highland County Press. He can be reached at sforsha@gmail.com. Stephen, what a great column. You do an excellent job, and I'm proud of (and impressed with) your longevity and talent. Stories like these also make me proud to be from Highland County, a place that warms my heart often. This comment has been hidden due to low approval. Great column Stephen!! This comment has been hidden due to low approval. Love this Story. This comment has been hidden due to low approval. Nice column Stephen, I was at the Hillsboro/ Greenfield game and got to witness that great moment for Maddy. I've also watch a film clip of Nate's shot. What great memories for these student athletes. There are many, many lessons to be learn by playing sports, but the caring attitude of these coaches is one of the best examples of sportsmanship these kids will ever see. Good luck in your tournaments, Coach Moberly and Coach Kibler!! This comment has been hidden due to low approval. I would like to also mention that before the varsity boys game at Greenfield McClain on their senior night at their gym they were nice enough to individually recognize Hillsboro senior players and cheerleaders. Class act, Greenfield McClain. Very nice gesture on the part of everyone involved. This comment has been hidden due to low approval. Very nice column, Stephen. Thanks for reminding us what sports are all about. – RR This comment has been hidden due to low approval. Maddy is my granddaughter. What an uplifting story about Maddy and Nate Frazer. Thanks for sharing these precious memories. Rough year for Maddy, but I feel God has bigger plans for her in the future. We take what we are dealt and use it for a bigger and more positive purpose in life. Thanks again for this story. Carole Martin This comment has been hidden due to low approval. Beautifully written by a great supporter of Highland County Athletics. So wonderful to hear about the acts of kindness shown by all involved. This comment has been hidden due to low approval.